The Lobster Trap has been providing grocery stores, restaurants, distributors and home kitchens with the finest clams casino made in America for over 30 years. Fine diners in the Upstate, NY area have enjoyed our unique, all natural and deliciously prepared gourmet Clams Casino from our subsidiary, Dave’s Locker Clams Casino. Try them today! You’ll never be disappointed! 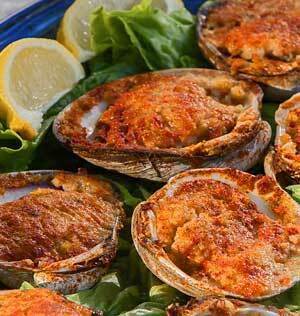 Our clams casino recipe uses only fresh, live ocean clams. 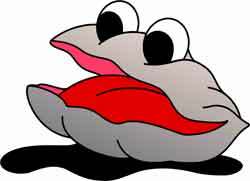 Most companies who make prepared clams casino use processed clams. For the absolutely best clams casino, its gotta’ start fresh! Our packages of clams casino contain six halves of clams casino in their shells and frozen. They cost only $3.99 per package! Even better, we also sell three packages for only $10.50! Our clam casino packages are very easy to cook, and are ready to be on your table in only 10-12 minutes! After removing them from their packaging, place the frozen clams casino face up on your broiler pan for 10-12 minutes or until done! Serve hot. Simply remove your frozen clams casino from their packaging and grill them face up at medium-high heat until the calms are cooking in their own juice. After about 15 minutes and they will be ready to enjoy! Who buys Clams Casino from us? Besides our headquarters in East Rochester, NY, our clams casino are available from a variety of sources in the Buffalo, Rochester and Syracuse areas. We supply grocery stores, catering services, country clubs, retail seafood locations, restaurants and wholesale distributors. If you would like to learn more about how you can provide your family or your restaurant’s customers with high quality Clams Casino, call us today! *Note – This product meets all criteria of the F.D.A.’s National Shellfish Sanitation Program and are manufactured in a HACCP approved facility. Dave’s Locker Clams Casino is a subsidiary of The Lobster Trap.